MALDEN, Mass. – Up and down the line-up, the Malden Catholic hitters' demeanor at the plate was a look of bewilderment. Not knowing what was coming out of Luke Delongchamp's right hand next, the Lancers swung repeatedly at air as the freshman hurler, yet again, was masterful. In a game Malden Catholic needed to have, they instead came away stymied by a 15 year-old St. Peter-Marian up and comer. 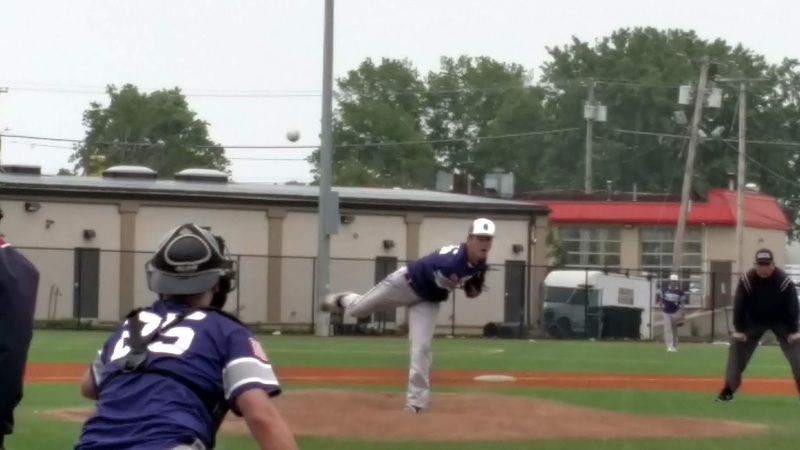 Delongchamp was in complete control throughout, allowing just one hit while striking out 10 as St. Peter-Marian defeated Malden Catholic, 5-0, in the finale of the Malden Catholic Tournament at cool and drizzly Rotondi Field on Sunday afternoon. Delongchamp carried a no-hitter in the sixth inning but saw that streak come to an end thanks to Josh Doyle's one-out single. Nevertheless, Delongchamp, showing no signs of emotion, merely shrugged off the hit and proceeded to set Malden Catholic down the rest of the way. "All of my pitches were working today," said Delongchamp. "My change-up was working well for me as were my curve and slider. Even when I got behind in counts I still felt like I could go to my off-speed stuff." With the victory, the Guardians (13-4) are now riding a robust 11-game win streak. The Lancers (8-10) need to win their final two remaining contests against BC High and Arlington in order to qualify for the Division 1 North tournament. Unbeaten during the month of May, St. Peter-Marian continues in its quest to be awarded a spot in the upcoming Super 8 tournament. With four games on tap for this upcoming week, including contests against mighty Wachusett Regional and St. John's Prep, the Guardians will have the opportunity to prove themselves. "Since we have gone on this streak all of us are feeling very confident in the way we play and how we approach each game," Delongchamp said. Facing Malden Catholic ace Chris Peguero, the Guardians were able to jump on the hard-throwing righty for a pair of runs in the third. With one out, Dan Malm laid down a bunt single. After Peguero retired Frank Hernandez, he then issued back-to-back singles to Jared Kupurch and Kosta Drosidis. Drosidis's hit scored Malm, but on the play, the ball skipped off of the glove of right fielder Kyle Holmes allowing Kupurch to sprint home. Peguero ran into more trouble in the fourth. Delongchamp doubled and a pair of walks loaded the bases with two men down. A few moments later, Peguero (4 IP, 5 hits, 8 K's, 2 walks), uncorked a wild pitch, sending Smith across the plate with St. Peter-Marian's third run. After fanning Hernandez, and keeping the damage to a minimum, Peguero's day was finished. The Lancers' woes in the batter's box, meanwhile, continued. In four of seven innings, Malden Catholic went down in order. Repeatedly, the Lancers came to the plate only to walk back to their dugout in utter frustration. "Luke was just outstanding today," said St. Peter-Marian coach Ed Riley. "He continues to amaze me because he is pitching like a senior. He loves to compete and he throws strikes. We help him with his pitch selection and he just goes out there and executes. For a kid that young, it is very impressive in what he has done. We are riding with a lot of confidence right now and are playing well." After going down in order in the sixth against reliever Nick Iannuzzi, the Guardians responded in the top of the seventh to generate some insurance. Back-to-back triples from Malm and Hernandez made it 4-0. Two outs later, Aidan McAvoy's ground single up the middle pushed St. Peter-Marian ahead, 5-0. In the bottom of the frame, the Lancers had a runner on with one out but Delongchamp finished things off by fanning Peguero and inducing a pop out to seal the win.